Opening Reception: Saturday, October 13, 2018, 6-9 p.m.
Open: Thur, Fri, Sat 12-6 p.m.
Refractions occur when waves travel from one medium to another, typically when entering media at an oblique angle. The boundary from one medium to another changes the wave’s phase velocity and a concurrent change in direction, but without altering the wave’s frequency. For example, a light ray leaving a glass will refract - and this led to the inventions of the lens and the refracting telescope. In their art works artists Marion Di Quinzio and Nathan Durnin explore the bending of shapes and colors in their unique and creative ways. Nathan Durnin paints a fusion of image and solid blocks of color. This combination may be a disruption of an image, but through the disruption it creates an additional state of color and composition. 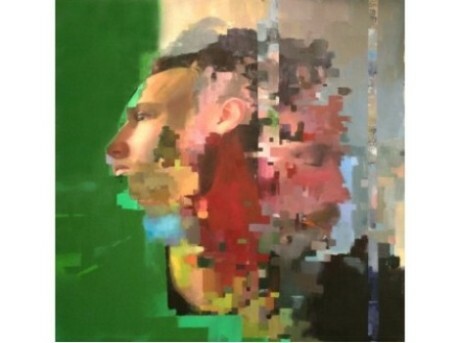 Video stills with glitches, broken pixels, and digital artifacts are frequently the launching point of his paintings - the camera captures more than can be directly observed. Durnin merges a digital source and tangible paint in exciting and unexpected ways. In addition to being a practicing artist, Durnin also teaches painting and drawing at Delaware County Community College and the Wayne Art Center. Durnin received his Master of Fine Arts degree from The Pennsylvania Academy of Fine Arts in Philadelphia. He is the recipient of the Artists’ House Gallery Award, the Benjamin West Prize and the Charles Toppan Prize among other notable drawing and painting awards. Marion Di Quinzio paints colors and shapes progressively toward greater complication and complexity. She is moved by the magic of colors and the rhythm of shapes. 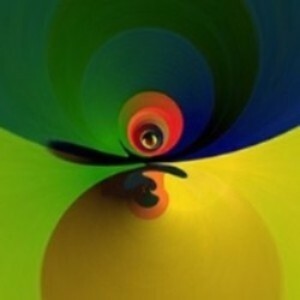 Each shape, regardless of its position or size, has a disproportionate influence on the whole canvas, and becomes a metaphor for a metaphysical world. Di Quinzio was born and raised in the Netherlands. After high school, she moved to the United States where she earned a Bachelor of Sciences degree from Carnegie-Mellon University and a Master of Arts degree from the University of Pittsburgh. She has lived and worked in Germany, Suriname, Venezuela and Hungary, and continues to travel extensively. Marion has exhibited her work in galleries in Pennsylvania, New York, New Jersey, and Germany, and her work is among many private and institutional collections in the United States and Europe.